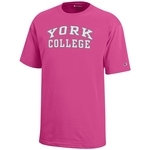 The York College Bookstore offers a wide variety of York College of Pennsylvania apparel that can suit any Spartan. A classic tee with a 1x1 slub rib at the collar and a set-in short sleeve. Keep warm with our Champion Quarter-zip sweater, has a covered zipper, and welt pockets for storage. These Champion jogger's are a must for any active youth. These Champion shorts are a must for any active youth. Champion Youth Long Sleeve T-shirt features York College imprint on the front chest. Features double layer hood and front pouch pocket. Champion standard youth T-shirt with screen imprint of York over College on front. Charles River fleece pullover quarter zip jacket features ladies fit sizing, yarn-dyed to produce a unique heathered appearance, and contrast knit binding adding a unique design detail. Charles River ladies* heritage jacket features two-layer bonded knit jacket for added warmth, Chin guard and storm flap for added weather protection, Full zip feminine silhouette for a perfect fit, Covered in-seam zippered front pockets for reduced bulk. *Ladies/junior fit. May need to go up in one size for best fit. Charles River Heritage jacket features two-layer rib knit bonded to polyester fleece for added warmth and zippered side pockets. Charles Ladies* River Rain Jacket is wind and waterproof with heat-sealed seams, lined with grey mesh in the body & front yoke, 2-way zipper allows for freedom of movement and full-length wind flap, and 3M reflective trims across the front and back provide high visibility. College Kids bandana bib with York College arched over YC. Natural cotton with York College Spartans est. 1787 imprinted on the front. York College Spartans infant set including a bodysuit and bib. This College Kids tee is for all the Spartans in trainning. Comfort Color tee features a Rock the Shamrock perfect for the St. Patty's day celebrations, washed garment offers double needle collar, twill taped neck and shoulders, and double-needle armhole, sleeve, and bottom hems. Our Gildan York College tee is always wearable anytime, anyplace. Our Comfot Wash tee has a front pocket on the left chest, and a back design showing off that school spirit. Comfort Wash tee features double-needle coverstiching, twill neck tape, ribbed set-in collar, and 3/4" hems. This York College Crewneck is all about comfort, in color and feel. This York College Hoodie is all about comfort, in color and feel.